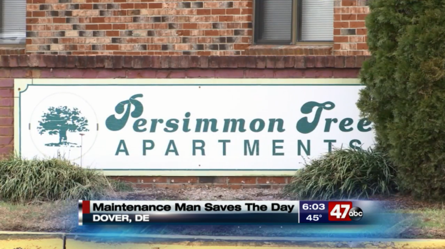 DOVER, DE – A maintenance man is being hailed as a hero in Dover after he put out a fire in an apartment complex, saving four children. While the cause of the fire is not known, it started just after 1:30 p.m. in an apartment. As soon as the building’s maintenance man was alerted to the fire, he used a portable fire extinguisher to put it out. After extinguishing the fire, he learned that there were four children in a room that was adjacent to the where the fire had started. No one suffered any injuries as a result of the fire.